You know your credit scores are important. They can make or break your applications for loans and credit cards. When you’re approved for financing, your scores can impact how much you’ll pay and the terms you are offered. Of course, you can know that your credit scores matter without understanding how they are calculated. Our “What Makes Up Your Credit Scores” series aims to help you fix that disconnect. Learning what makes up your credit scores is the first step toward earning and keeping better credit. In parts one and two of this series, we revealed how the first 65% of your FICO credit scores are calculated. As a refresher, most of your scores are based upon your payment history and how much you owe on outstanding debts, especially credit cards. Yet 35% of your credit scores don’t have anything to do with those factors. Your age of credit history is the third most important credit report category considered by FICO. It’s worth 15% of your FICO credit scores. As a rule of thumb, having older accounts on your credit reports is good for your scores. When you have aged tradelines on your report, it shows that you’re a seasoned borrower and less of an unknown risk. 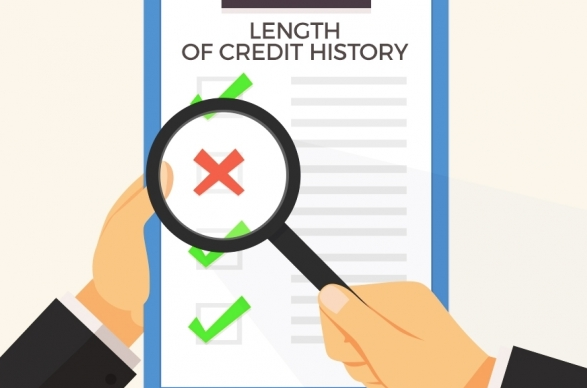 What Matters in the Age of Credit Category? How long ago did you open the oldest account on your report? What is the age of your newest account? What is the average age of all accounts on your report? How long has it been since you used your accounts? When it comes to the age of your credit, you often have to sit back and be patient. You can’t turn back the clock and make your accounts any older. Still, there is one actionable way you may be able to improve your credit scores within this category. You can become an authorized user. The strategy works by simply asking a loved one for a favor. Your friend or family member can call up their credit card issuer and add you onto an existing account as an authorized user. If the card issuer reports the account to the three credit bureaus (as many do), the age of the added account might help to improve your average age of credit. If the account is older than any others on your report, the age of your oldest account might increase as well. While the authorized user strategy has some great potential benefits, you shouldn’t try it without knowing about these potential problems. The account could hurt your scores. Authorized user accounts have the ability to help or harm your credit scores, just like any other account on your credit reports. Being added as an authorized user onto a poorly-managed credit card account (e.g. one with late payments or a high utilization rate) could impact your credit scores negatively. If you’re added to an authorized user account which becomes negative in the future, you can request to be removed from the account. As an authorized user, you typically aren’t legally liable for the debt. Beware of tradeline rental scams. A tradeline rental scam is when you pay money to be added as an authorized user to a stranger’s account. There are companies who, for a fee, will broker an arrangement between you and a stranger. You pay a fee (of which the broker pockets a percent) and you are added onto the credit card account of someone you don’t know personally. Here’s why tradeline renting is dangerous. When you rent a tradeline from a stranger and secure a loan after the fact, it may be considered bank fraud. Want to schedule a free credit analysis with a Financial Renovation Solutions credit consultant? CLICK HERE or call 214-856-0068. Please join us for the rest of our credit score series. Understanding how your credit scores are calculated is an important step in your journey toward better credit.